Greg Beggs, patent attorney for Dr. Steven Chudik, following a precedent-setting case he argued and won for a patent on a proprietary procedure Dr. Chudik developed. If you ask Greg Beggs, patent lawyer, gardener, golfer, former Downers Grove Village Zoning Board and Plan Commission member, Downers Grove Chamber of Commerce enthusiast and grandfather of 10, success throughout his life came because he was in the right place at the right time. His legal career began in a modest way. While raking leaves in the family’s front yard a man walked by with a bag of groceries that broke scattering items everywhere. Beggs, a high school senior at the time, supplied a replacement bag from the house. That gesture and subsequent conversation about Ivy League schools where the passerby’s son graduated illuminated a possibility Beggs had not considered up to that point. Beggs earned his undergraduate degree about four years later from Yale and he and the passerby became friends. After Beggs received his undergraduate degree, the passerby and now friend introduced him to another acquaintance, the Dean of the Law School at The University of Chicago (U of C). Not long after, Beggs found himself studying law at the U of C with the goal of becoming a corporate attorney. However, Uncle Sam and the U.S. Army had other ideas. Beggs graduated from U of C Law and then served his country for two years teaching recruits about shooting ground to air missiles. When he returned home, Beggs needed a job. Once again, fate intervened. During a routine examination, Beggs’ dentist told him about a friend who needed help preparing for an upcoming legal trial—a patent infringement case about windowsill-mounted air conditioners. Beggs interviewed and got the job, but there was a small problem—Beggs knew nothing about patent law. Fortunately, extensive trial preparations and time moved on. Beggs learned patent law on the job and took the necessary night courses at John Marshall Law School. The trial occurred and soon afterward Beggs sat for the Patent Office examination. 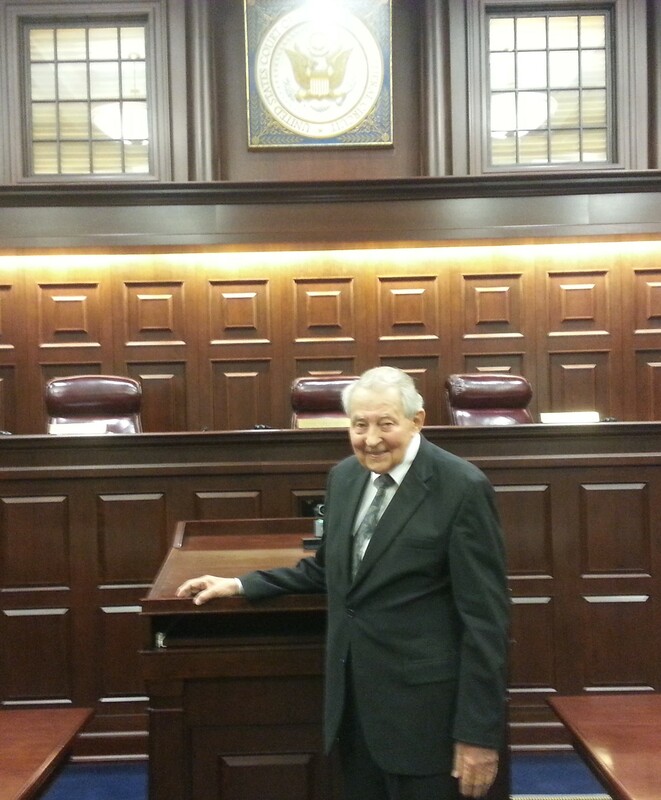 That officially marked the start of his 60-year career practicing in the Patent Office as well as in State and Federal courts. During a subsequent appointment, Dr. Chudik inquired about the type of law Beggs’ practiced. That appointment led to a long association. “Dr. Chudik is a talented surgeon who is always looking for a better way to do things for his patients,” Beggs said. “He told me that he had designed several arthroscopic instruments and novel arthroscopic surgery techniques that he wanted to patent, but he was having trouble getting the legal work done. From that point on, we’ve worked together. I’ve been able to assist him with a number of patent applications, several of which have been issued as patents. Beggs said he enjoys putting into words the ideas of inventors and then finding ways to explain them to patent examiners and judges. “I’m still not sure how I got into this specialty, but it fascinates me more and more every day. The newness of each development as it comes along is nothing about which to be reluctant. It is like reading a book, you always want to learn what’s on the next page,” Beggs opined.